^ "Mosaic Browser". Retrieved 2012-03-16. ^ Zwicky, E.D, Cooper, S and Chapman, D,B. (2000). Building Internet Firewalls. United States: O’Reily & Associates. p. 804. ^ a b c d e Niederst, Jennifer (2006). Web Design In a Nutshell. United States of America: O'Reilly Media. pp. 12–14. ^ Castan ̃eda, J.A; Francisco Mun ̃oz-Leiva, Teodoro Luque (2007). "Web Acceptance Model (WAM): Moderating effects of user experience". Information & Management 44: 384–396. ^ Iteracy. 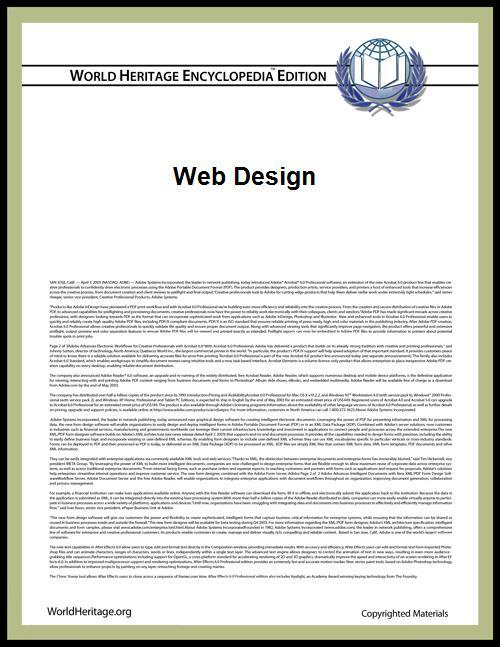 "Web page size and layout". Retrieved 2012-03-19. ^ Stone, John (2009-11-16). "20 Do’s and Don’ts of Effective Web Typography". Retrieved 2012-03-19. ^ Oleksy, Walter (2001). Careers in Web Design. New York: The Rosen Publishing Group,Inc. pp. 9–11. ^ Davies, Anthony, J. "What is a UX/IA?". Retrieved 2012-03-19.